The DITRA-HEAT heating cables cannot be installed under vanities, bathtub platforms, free standing bathtubs, kitchen cabinets and islands or any other fixtures or in closets. Excessive heat will build up in these confined spaces and may cause cable overheating. Additionally, heating cable placement is limited by minimum spacing of 2" (50 mm) from walls, partitions, and fixed cabinets, 8" (200 mm) from heat sources such as baseboard heaters, fireplaces, forced air heating ducts, etc., 4" (100 mm) from plumbing drains, and 7" (180 mm) from the centerline of toilet drains. 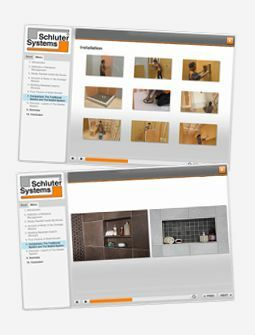 Please refer to the Schluter®-DITRA-HEAT Installation Handbook for a complete list of limitations, requirements and installation guidelines. Please also refer to applicable building and electrical codes in your area.